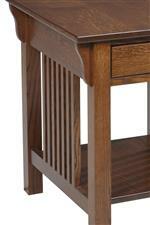 Celebrate classic mission style with this hall table. The piece features mission style's distinctive slat detail on its sides, and is crafted using solid woods in the Amish tradition. One shelf and two drawers provide simple storage, while four solid wood options and a variety of finish and hardware options allow you to customize the look and make the piece your own. The Lexington Mission Hall Table with 2 Drawers by Y & T Woodcraft at Saugerties Furniture Mart in the Poughkeepsie, Kingston, and Albany, New York area. Product availability may vary. Contact us for the most current availability on this product. Celebrate classic mission style with the rustic, masculine designs from the Lexington Mission accent table collection. Each piece is made in America in the Amish tradition, using your choice of oak, maple, cherry, or quartersawn oak solid woods. Slat detailing on table sides and block legs give each table its distinctly mission look, while a variety of custom finish and hardware options let you put your own stamp on the look. The Lexington Mission collection is a great option if you are looking for Mission furniture in the Poughkeepsie, Kingston, and Albany, New York area. Browse other items in the Lexington Mission collection from Saugerties Furniture Mart in the Poughkeepsie, Kingston, and Albany, New York area.